On a chilly Sunday afternoon the Gaelic footballers of BC and the Irish Sports Youth League got the ball rolling for the 2017 outdoor season when the teams met in a very exciting challenge match at the Irish Cultural Center. With the last of the late winter snows still visible in corners of the grounds at the ICC, the players of each team got down to business and played out a competitive 60 minutes of football. BC had the upper hand in the goals column, while the local minors picked off their points as the game ebbed and flowed up and down the field. The final tally would give victory to BC by a score of 2-12 to 8-4, but the score was secondary to a great game of football and what might prove to be an annual event that works towards the development of the game in the region. The Gaelic football club at Boston College has been in existence for the past several years, and it was a great opportunity for the team to get some competitive action at the local level, and vice versa for the minors. The ISYL are planning to enter a minor team into the Junior B football competition this season and BC are looking towards the All American competition in Philly in April. Brian O'Connell (BC), with Ellen Joyce. A presentation to each captain, BC’s Brian O’Connell, and the ISYL’s Dennis Harrington to mark the occasion. ISYL Minors: Declan O’Sullivan, Peter Bannon, Shane Kenny, John Kenny, Aidan Joyce, John O’Doherty, Stephen Joyce, Aidan Cadogan, Sean Winston, Dennis Harrington, Declan Harrington, Emmet Smith, Colm O’Malley, Gerard Gannon, Jerrard Davoran, Liam Davoran, Matthew Duane, Michael Kerr, Devin Corbin, Nessan O’Donnell. Boston College: Sean O’Rourke, Aidan Fitzpatrick, Ryan Connell, David Sage, Peter Herlihy, Patrick Toppin, Chandler Williams, Danny Gardner, Tom Rogan, Joe Kenny, Zach Lynch, Brian Crowley, Patrick Doyle, John King, Brian O’Connell, Jack Daum, David Saustad, Sean White, Andrew Provines, Joseph Bauer, John Pugh, Rory O’Donnell, David O’Connor. The 2017 Boston Northeast Divisional board was elected at last Sunday’s AGM at the Irish Cultural Center. The meeting was attended by all 21 clubs from the Boston area and the wider New England region. The meeting proceeded expeditiously with discussion around promotion, youth and games development, and of course expenses of running the games. Two motions passed by a show of hands. The first was submitted by the Boston Shamrocks to ensure all championships are scheduled to conclude 2 weeks before the North American Finals to allow time for the winning clubs to organize travel and figure out covering the expenses. It was suggested that the schedule be condensed or that championships start earlier, and the motion passed. Galway football club put forward the other motion to pass, that a senior club’s second team no longer be required to enter the Junior A football competition. The election of officers went smoothly. Two positions went to a vote. The first was chairman with John Farrell coming in ahead of John Cunningham. The voting slips were out again for the position of Registrar. This time Shane McKenna polled higher than Gerard O’Kane. The positions were filled as follows: Chairman – John Farrell (Aidan McAnespies), Vice Chairman – Gerry Prior (Wolfe Tones), Secretary – Nessa Oates (Boston Shamrocks), Asst. Secretary – Ian “Squealer” Murphy (Wolfe Tones), Treasurer – John McDevitt (Armagh-Notre Dame), Asst. 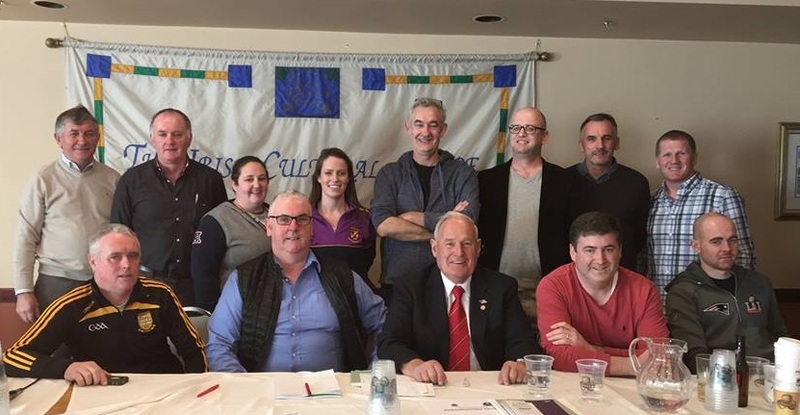 Treasurer – Peter Murray (Galway Hurling), Registrar – Shane McKenna (Aidan McAnespies), PRO – Rory O’Donnell (Connemara Gaels), Trustees – Brendan O’Donovan (Shannon Blues), Eddie Feeley (Shannon Blues), Eileen Kerins (Boston Shamrocks). Bernie Reilly is Honorary President for 2017.